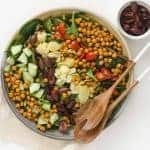 Filled with roasted chickpeas, cucumbers, olives, and artichoke hearts, this Mediterranean Salad is sure to be a favorite. Spring is in the air, and salad for dinner is one of my favorite things to transition to this time of year. I LOVE all things Mediterranean in flavor, and this salad is one of my all-time favorites. 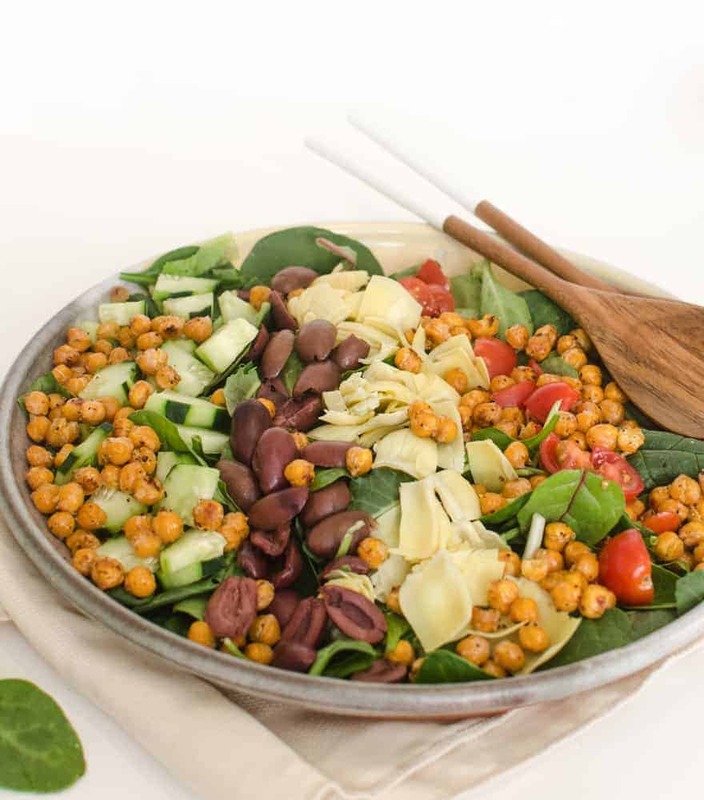 The roasted chickpeas add enough fiber/protein that you can serve this as-is for a main dish (though the addition of some grilled chicken or shrimp would be delicious), which makes it one of my favorite meatless hearty salads. You can also serve this as a side dish. This would be great with any kind of grilled protein, fresh stone fruit, and maybe a warm couscous or rice dish to go along with it. 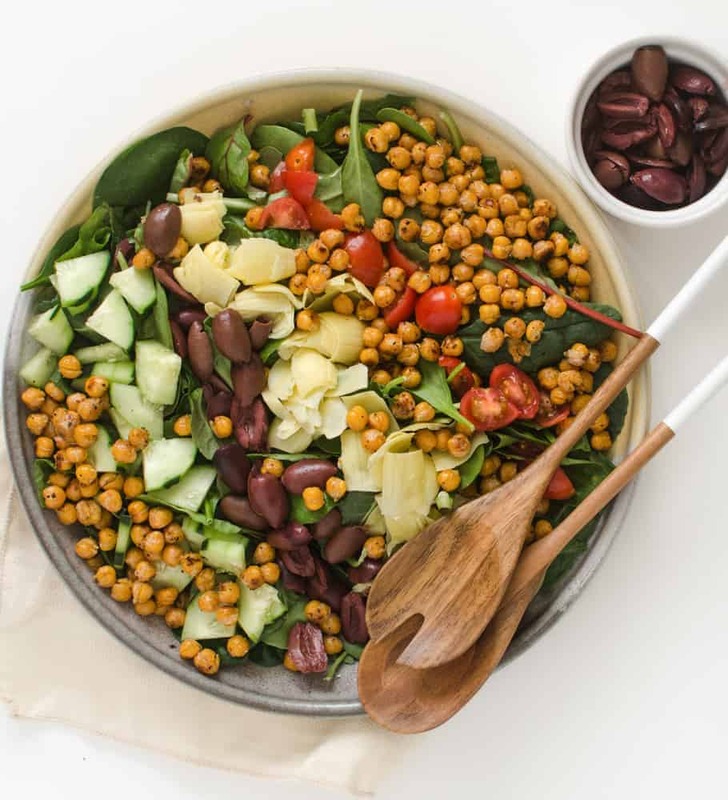 No matter how you serve it, Mediterranean Salad with Roasted Chickpeas is going to be a favorite all spring/summer/year long. Can we talk for 2 seconds that is the wonder known as roasted chickpeas? We’ve been obsessed with them all year long and there’s no end in sight. You guys, they are so good warm right off the pan. Don’t think you have to save them for a salad – you can eat them as soon as they come out of the oven for a snack. I love that they are inexpensive to make, they are quick to prepare (takes about a minute to get them into the oven), and when they come out of the oven, they are warm, crispy on the outside, creamy on the inside, and so delicious. 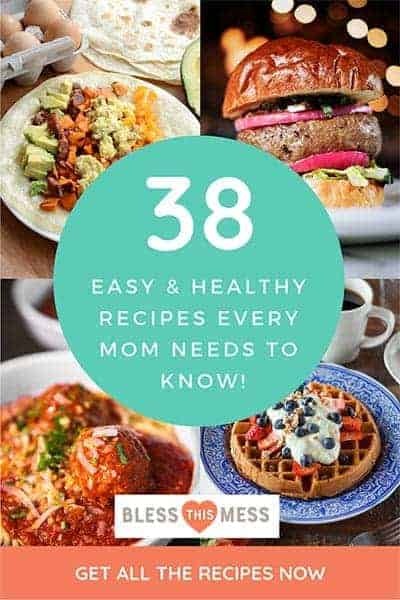 Plus, you can add whatever seasonings you like to them; you really could add anything that you like, want, or have on hand. It’s very flexible! I’m planning on planting cabbage, green onions, normal onions (white/yellow/red), carrots, and beets this week. Then we’ll have to wait until May to finish planting all of our cold sensitive plants. Last year was a year off of gardening, but I’m so excited to be back at it again. I’ll be sure to share some updates as I have things to show. While we are on the topic of hobby farming, my chickens are laying SO well! I’m getting 10-16 eggs A DAY! That’s so many eggs. We eat a whole lot of scrambled eggs, egg bake for dinner, and egg salad for lunch. Even with all of our eating and baking, I’m not keeping up with the chickens. I officially have more eggs than I can use, and that is something that has never happened to me before. It is wonderful and I’m not at all sad about it. We’ve been giving eggs to friends and family and it’s such a wonderful pretty gift to give. If you were closer, I’d be pawning them off on you too. This recipe is great with this classic vinaigrette recipe (you can also sub the called for vinegar for balsamic, that’s great too). This roasted garlic dressing is also one of my favorites on this salad. I’d recommend both for this Mediterranean salad! This would also be excellent with the addition of feta cheese. Yes! 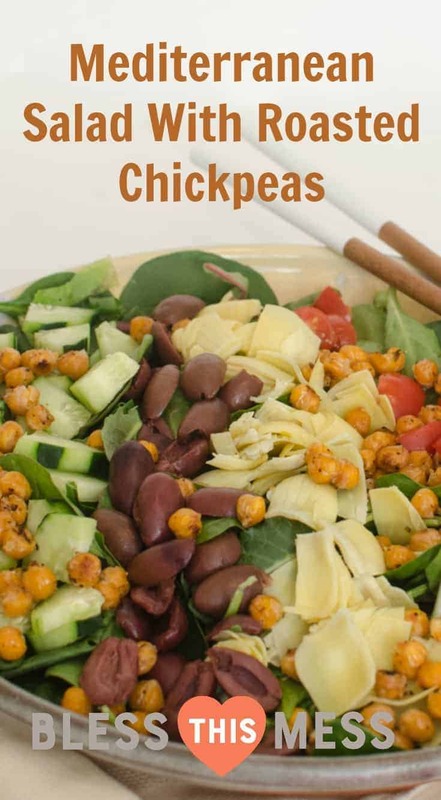 Chickpeas are high in fiber, protein, and contain lots of vitamins and minerals. 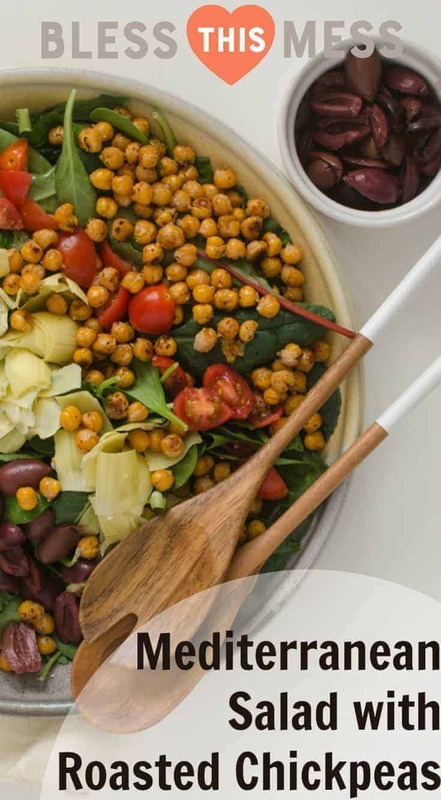 Are chickpeas a healthy snack? They are a great snack because they are high in protein and fiber. When chickpeas are baked, they get crunchy like nuts. Try them for a healthy snack! Place the chickpeas in a small bowl and add the olive oil. Give the chickpeas a stir so that the oil coats them well. Add the salt, garlic, and pepper and stir again to combine. 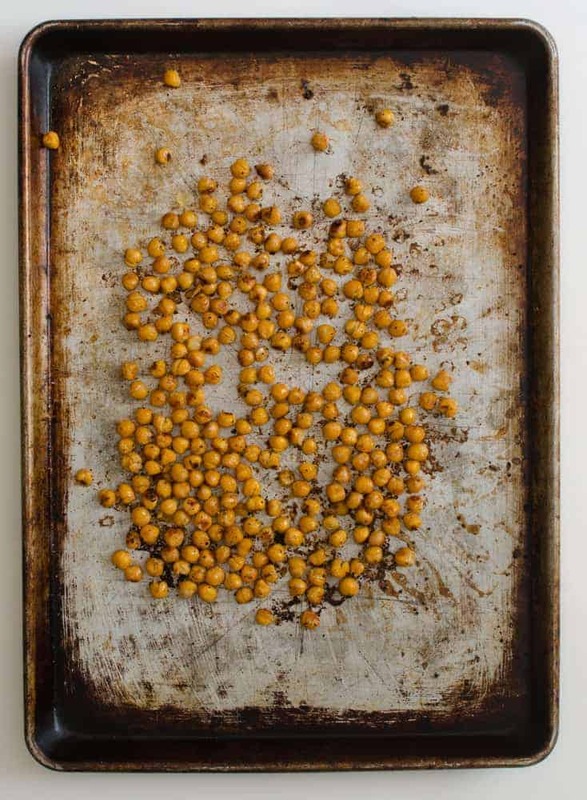 Place the seasoned chickpeas on a baking sheet and bake for 20-30 minutes, stirring every 10 minutes, until the outside is crispy and darkened and the inside is creamy. Remove from the oven and let them cool at least 10 minutes before adding them to the salad. Place your greens on the bottom of your serving dish. 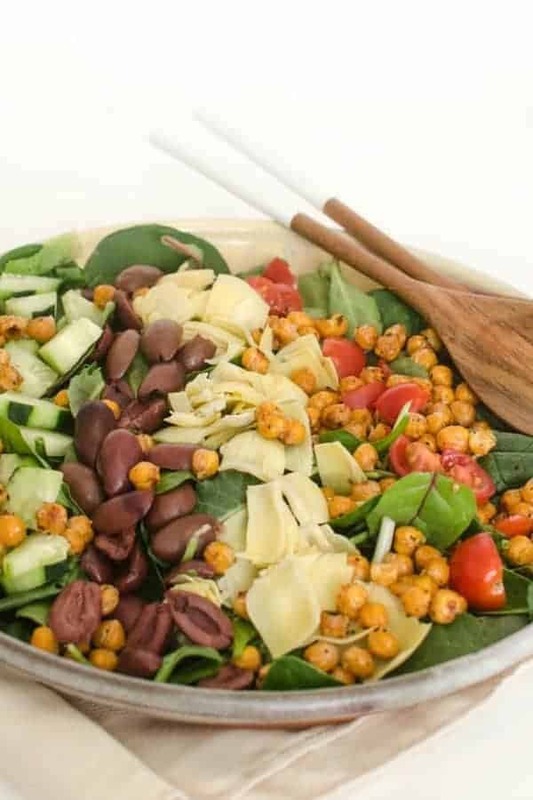 Place the roasted chickpeas, tomatoes, cucumber, olives, and artichokes on top. Serve with your favorite dressing. I recommend a classic vinaigrette or roasted garlic dressing (both are linked to in the post). There you have it. A little recap of a beautiful salad, dreams of summer produce, and an update on how our little hobby farm is going. 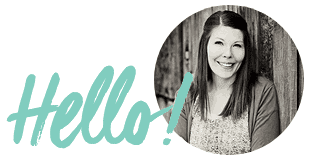 I plan on a house update, too – it’s coming along and I have a lot to show you! Enjoy this salad, from my home to yours. This salad looks so good, Melissa! Its a goal of mine to do more salad meals this summer!